Ancient Greece and Rome is something I will fully admit to knowing little about and so visiting these galleries at the British Museum is always an eye opener for me. 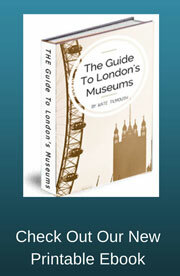 There are 17 rooms which collectively are the Greek and roman galleries so there is plenty to see. I must admit that these galleries alone could fill your whole day, there is just so much and it cover such a large geographical landscape too. I will only highlight a few of the galleries here to give you an idea of what these ancient Greece and Rome galleries contain. The monument dominates this small room and if you didn't know that you were looking at the real thing you would think that you were looking at a stage set. That's what blows you away, knowing that what you are looking at is the real thing. The monument dates between 390 - 380 BC and was built for Erbinna (Greek Arbinas), ruler of Lycian Xanthos, south-west Turkey. Erbinna was not Greek but wanted to be buried in a tomb that looked like a Greek temple. 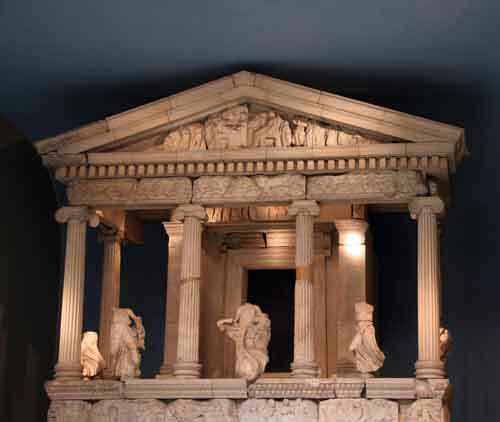 The Nereid (Nereid means sea nymphs, which are seen on the monument as decoration) monument is designed in a similar manner to the temples of the Acropolis in Athens. These statues and decorative plaques are taken from a temple which was built 2,500 years ago in Athens. The Parthenon has had a very varied history, being a temple then a church, then a mosque then a ruin. During this time the building and the sculptures were damaged at various times. Lord Elgin who was the British ambassador in the area between 1801 and 1805 decided to save some of the sculptures by removing them and bringing them to England. 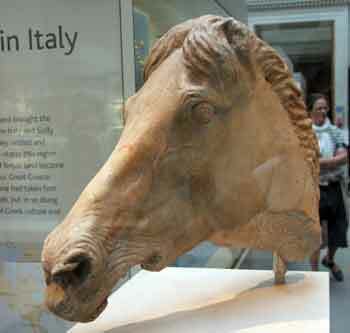 However in recent years there has been some discussion as to whether or not the sculptures should be returned to Greece and has caused some resentment between the two countries. At this time Britain feels that by keeping the pieces here that it helps to promote Greece and its ancient monuments and so there is no plans to return them. 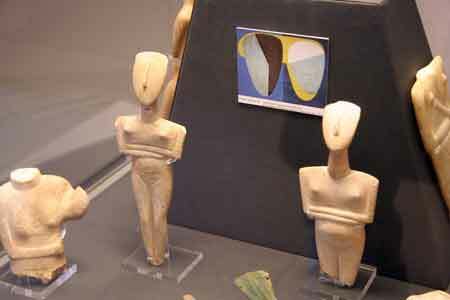 The Cycladic Islands is the old name for the current Aegean Islands. During the early part of the Greek Bronze Age, the islanders produced items made from copper, silver, lead and the fine white marble. These items are very modernistic in their appearance and the simple figures are personally some of my favourite naive sculptures. These ancient Greece and Rome galleries are tucked away a little but I would recommend that you do seek them out. The Greeks first went to Italy and Sicily in the search for new raw materials, one of the most important was metals. The resources they found ensured that they settled permanently in the area. The Greeks bought much of their culture to the area and this can be seen in the artefacts found there and are displayed in this room. These items include gold bowls, finely decorated wine bowls and bronze statues. In this room the items are arranged to illustrate the day to day lives of the Ancient Greeks and Romans. Items such as furniture and items used by women and children help to bring to life this long past civilization. Other items on display include farming implements, religious artefacts and transport related objects. I found that this gallery was both beautiful to look at but also very educational. it helped to bring these people much closer to our own lives as we can compare our day to day lives.